One button operate and easily take. High accuracy and special design. Auto power off. Visual alarm and menu setting. Six display mode. More than 30 hours for 2x1,5V AAA Alkaline battery. Measurement of pulsed blood oxygen saturation (SpO2) Measurement of heart rate The Lanaform Pulse Oximeter S1 is an easy way to monitor your heart rate as well your blood oxygen saturation (SP02). 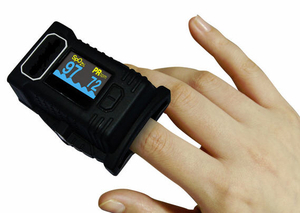 A pulse oximeter indicates the level of oxygen saturation of the hemoglobin in the blood, referred to as SpO2. The test is usually performed on the index finger, measurements being taken at the capillary level . Results can be used to diagnose poor binding between oxygen and hemoglobin, or other hematological problems. These devices provide a way to monitor and diagnose patients with chronic respiratory diseases. The compactness of the instrument is determined by whether the sensors are built-in or separate. There are both tabletop models for specialists' offices and portable versions for ambulatory use. Some provide additional data when equipped with a thermometer or a capnograph. As is often the case with monitoring devices, the most important criterion of choice is the instrument's precision.